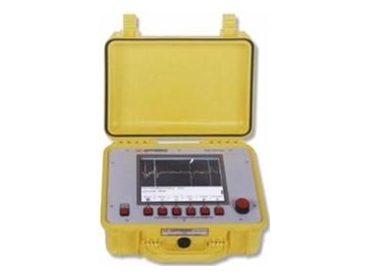 The TDR 1150 digital time domain reflectometer, available from Macey's Electrical , can be used on a variety of capacitive discharge devices, called ‘thumpers’. A high voltage coupler (also available from Hipotronics) is required as an interface between the TDR and the thumper. Basic mode provides a simple mode of operation for pre-locating cable faults. It provides step-by-step instructions and prompts the operator through the operation of the TDR and thumper. The auto range feature fits the cable trace on the screen, irrespective of the cable length. The TDR automatically sets the ‘start’ and ‘end’ cursors, and provides a numeric value for the cable length. The operator is then prompted to send a single high voltage pulse down the cable. The TDR displays the high voltage trace and places a fault cursor at the point of the fault, and displays the distance to the fault. There is no need to interpret traces or move cursors. The entire process can be completed quickly. Training time is reduced. In advanced mode, the operator has control of the TDR functions and settings. The advanced mode is password protected to prevent unauthorised use. This mode provides experienced operators with the diagnostic tools they need to find difficult faults. The advanced mode has the ability to move cursors and adjust screen size (zoom). With this mode, it is possible to access memory functions, measuring units, language choices and the option to reset defaults.